Once upon a time there was a great Danish company called Blue Willis that specialized in clothing made of natural materials using naturals dyes. 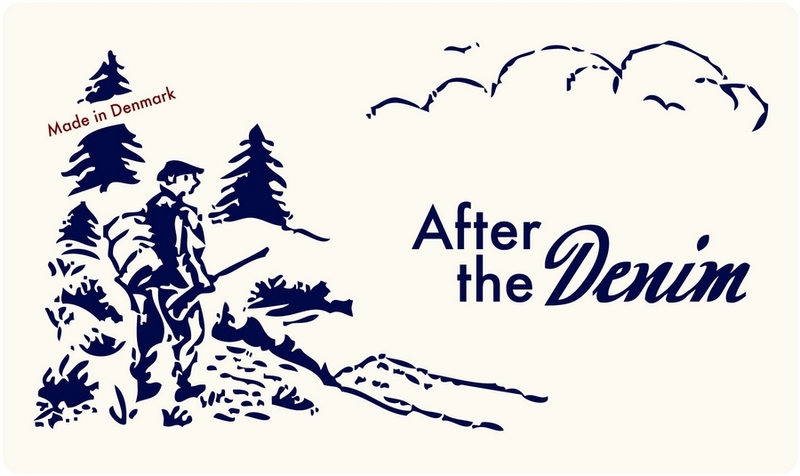 They were especially fond of indigo and made a lot of beautiful clothes in yarn dyed fabrics. Actually Blue Willis still exist, but production has moved out of Denmark, and the quality is nowhere near what it used to be, and the aesthetics is just different or may I say terrible. 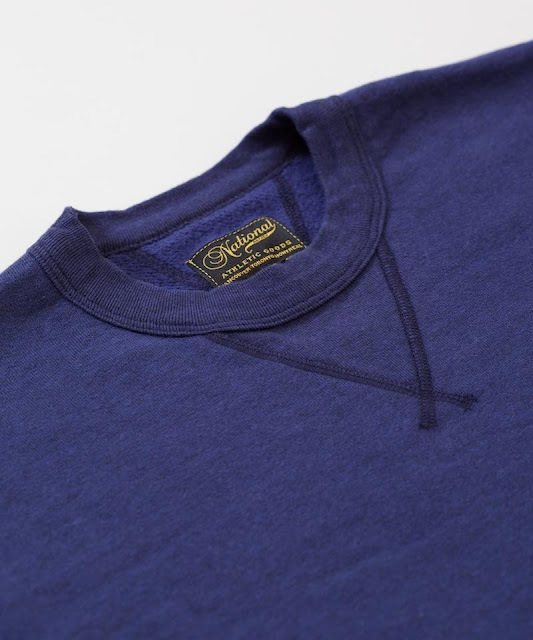 Now this post isn't about Blue Willis, I just felt that they were worth mentioning, as they made great indigo dyed clothing and I wish that more companies would do so, even though more brands are actually incorporating it at the moment. I like products made of a fabric that ages well. 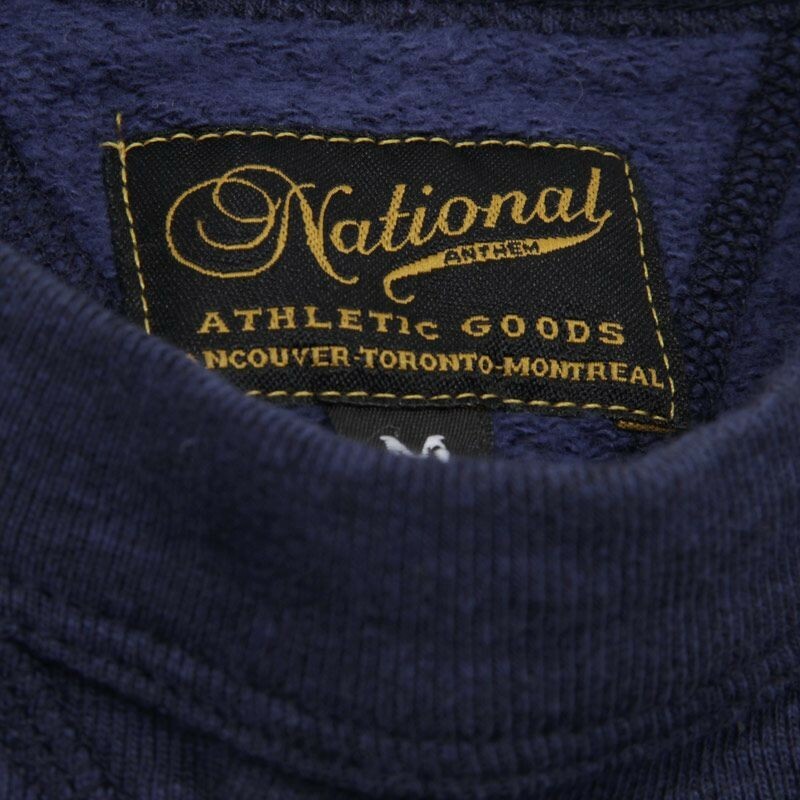 One of these brands is National Athlectic Goods, which is being made by Standard Design in Canada, which also produces Homespun Knitwear. 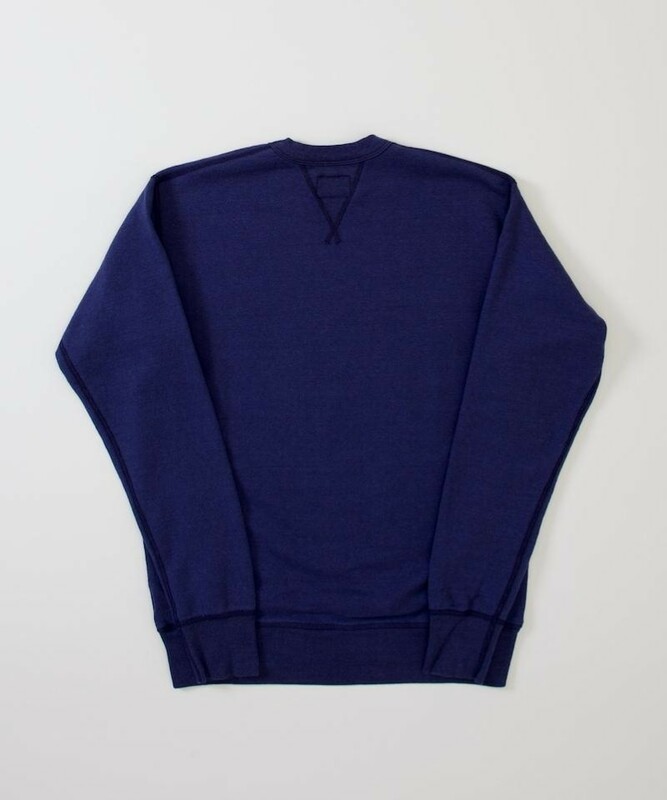 This sweatshirt is obviously inspired by vintage sweatshirts from the golden era of American sportswear and casual clothing, as it features the v-insert on the front and on the back. Other than that it looks very well-made and easy to wear, and most importantly it will continue to develop a richer colour due to the elusive indigo dye. Jeg har også holdt øje med deres sweats. Er firmaet bag ikke også dem, som udgiver Inventory Mag. Kender du noget til deres størrelser? Jeg synes også Sportswear Reg. ser interessant ud. Vintage inspireret og lavet i Italien. Vil du helst have kommentarer på engelsk? Hi TNN, I'll usually respond to comments in English, but you can comment in whatever language you prefer. I think people know how to use google translate, or at least I hope so. Of course I've come across Sportswear Reg, but I wasn't really convinced by the aesthetics and it didn't really appeal to me. 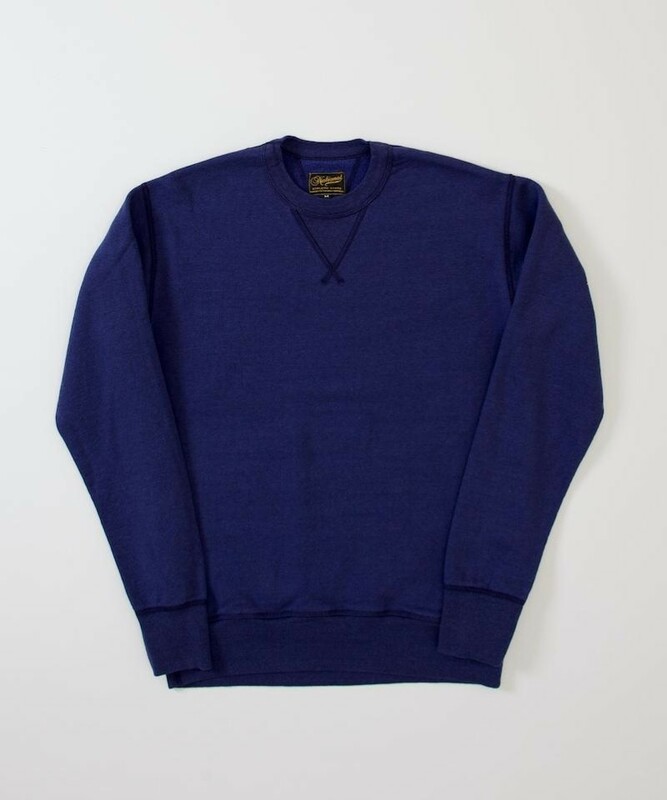 When it comes to sweatshirts I'll usually buy vintage sweatshirts like Healthknit for instance, or buy from CYC (Reigning Champ and Wings&Horns), which is made in Canada or from some of the excellent Japanese makers like The Real McCoys. I think the crew behind Inventory helps with the distribution - like an agency. But I'm not too sure about the connection. In regards to sizing I think it's quite regular - perhaps the sleeves are a bit shortish, which is probably because the brand is also targeted at the Japanese market. I got a National Anthem mackinaw jacket via Rakuten and I'm very happy with it. The sleeves were shorter than an equivalent jacket for the US market, but that works better for me. So if their stuff says "indigo" that means it is made with actual indigo dye? I've come across too much stuff for the US market that just uses it as a color term instead of referencing the type of dye. Shopping from Rakuten can be addictive... You can get so much good stuff there. 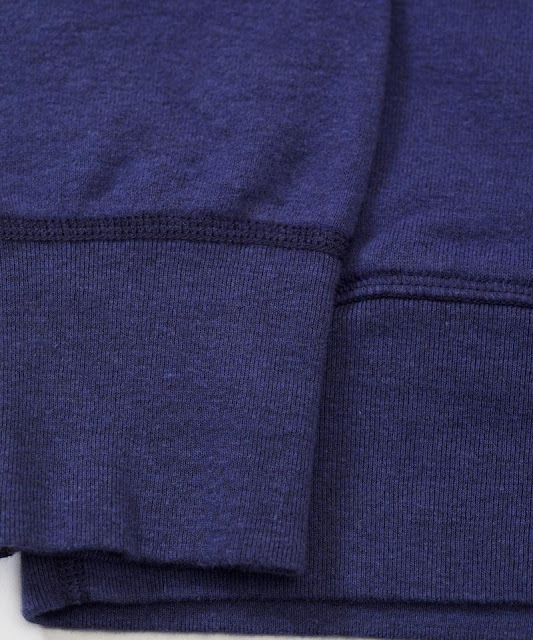 I would assume that it's constructed using indigo (synthetic indigo of course) yarns - they're widely available. Dip dyeing would be to labour intensive probably and it's hard getting a similar outcome when you dip dye.